I’m not generally a big fan of closing in a property with ultra-privacy screening. Tall fences, dense cedars and laurels–as we’ve seen before, they just say “KEEP OUT”. I prefer the “come on in and have a look” style of garden design. Having said that, hedging isn’t always a bad thing even for me. Shrubs that are not too tall, or are “airy”, or spaced widely, that are set well back from the public thoroughfare, that are fragrant and/or very floriferous (LOTS of flowers)–these can all constitute a welcoming hedge. 1. Ceanothus thyrsiflorus–California Lilac. A very drought tolerant bee-and-butterfly magnet, native to California (duh). Masses of blue flowers followed by reddish berries that deepen to black in the fall. Evergreen with small glossy crinkled leaves. I’ve posted this video before, but it’s worth a second view. If you think of “typical” California weather (if there is such a thing), you’ll know exactly what kind of conditions Ceanothus needs: full sun (altho’ many cultivars can tolerate some shade), very good drainage, minimal watering (except in the first year when it needs extra care to get established), no extra fertilizer (organic mulch being the exception). You can give Ceanothus a “haircut” every couple years, after blooming in the late spring. It can also be limbed up to give it more of a small tree look, but be careful with that. Ceanothus won’t sprout from old wood, so be sure when you trim back to old wood, it’s on purpose, not by accident. 2. 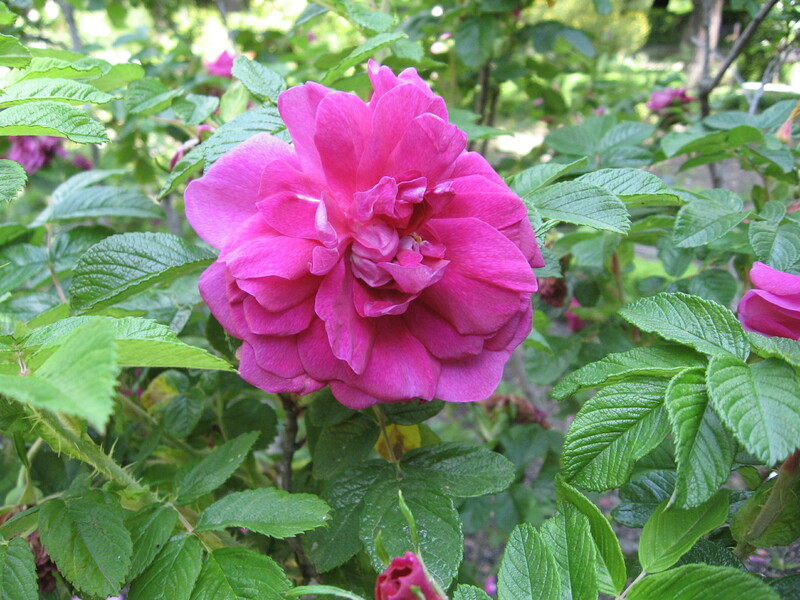 Rosa ‘Hansa’. 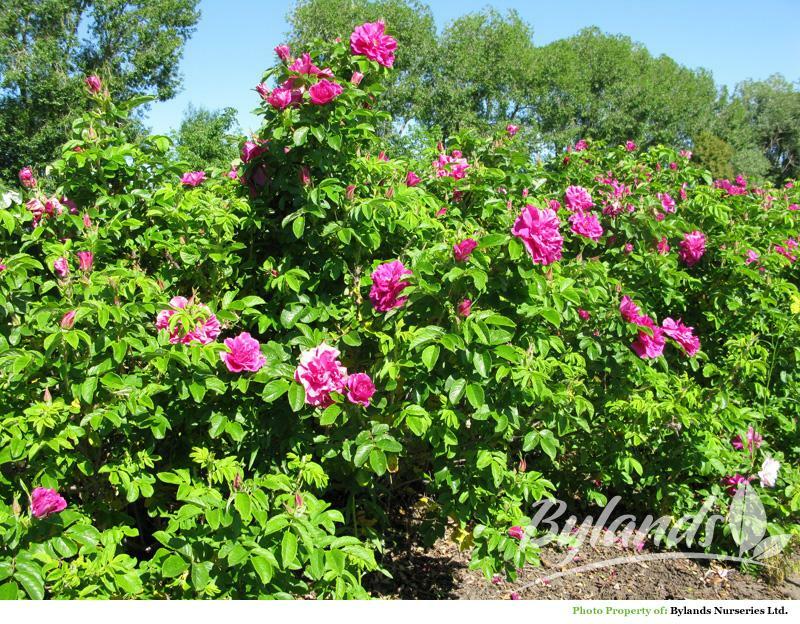 Magenta coloured Rugosa Rose ‘Hansa’ is a big, sprawling, fabulously-scented rose with nasty thorns. Not what you would ordinarily term “welcoming”, except that once you get a whiff of the fragrance, you have to follow the whiff to its source. Recommending a thorny sprawling rose as a guest-friendly hedge requires a little refining. First of all, most roses tolerate, or demand, some pruning. This rose can take a LOT of pruning. She’ll easily grow 5 feet in a season, so if you don’t prune her down pretty aggressively in spring, you’ll have something of a monster on your hands. She doesn’t need much else in the way of care, which is one of the reasons she gets a place on this list. My Hansa is growing in half shade, and still blooms “enough”. Full sun will produce many more blooms. She should be mulched (almost everything should be mulched…), but won’t need much if any extra water through our dry summers. And the best thing is that unlike any other rose I’ve ever had, she has never had any disease–no black spot, no powdery mildew, no rust. Of course, roses are deciduous, dropping their leaves in the fall, so in winter you’ll have a hedge of thorny sticks. For a while it will look like that “KEEP OUT” hedge. Sorry. 3. Ribes sanguineum –Flowering Red Currant. Native to coastal BC, Flowering Currant is allegedly the favoured flower of the returning Rufus Hummingbird. That would surely make it my favourite if it worked, but so far, I haven’t seen the evidence. But you can see the flowers are wonderful, the summer foliage is crisp and compact, growth is quite vigorous, but very easily controlled with pruning, and in late winter this will be one of the shrubs that you can force into blooming in your house by cutting branches early (Feb) and putting them in a vase of water. 4. -Oregon Grape. Another prickly shrub–in this case it’s the leaves, not the stems–that has three benefits that overshadow the “prickliness”: fragrant(1) flowers(2) that bloom in winter(3). 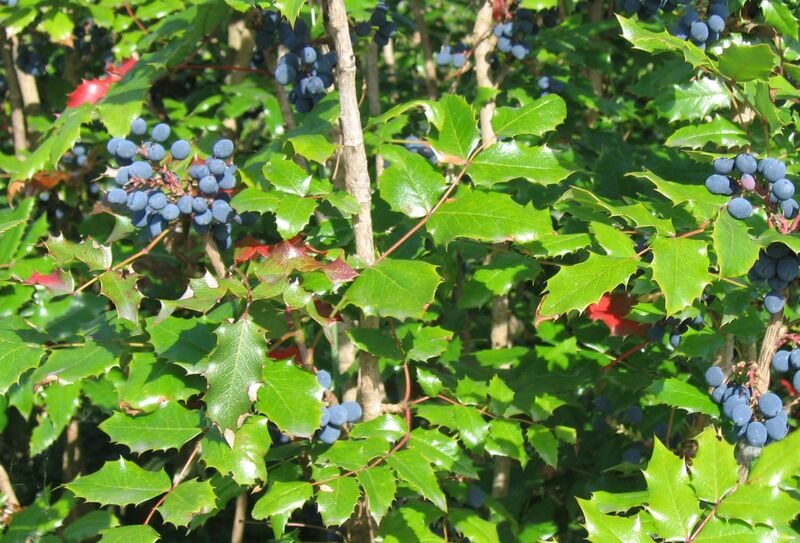 The blue-black berries that follow flowers on Mahonia aquifolium. Photo Credit. Another native plant, so is instrumental in keeping our local fauna happy; evergreen, civilized size that doesn’t mind being pruned to an even more civilized size, and leaves that often go reddish in Autumn. Take care cleaning up fallen leaves (even “evergreen” shrubs/trees loose their aged leaves sometime): they are particularly sharp when they’re all dried up. If you don’t prune after flowering, you’ll be rewarded with very tart berries that make amazing preserves. 5. 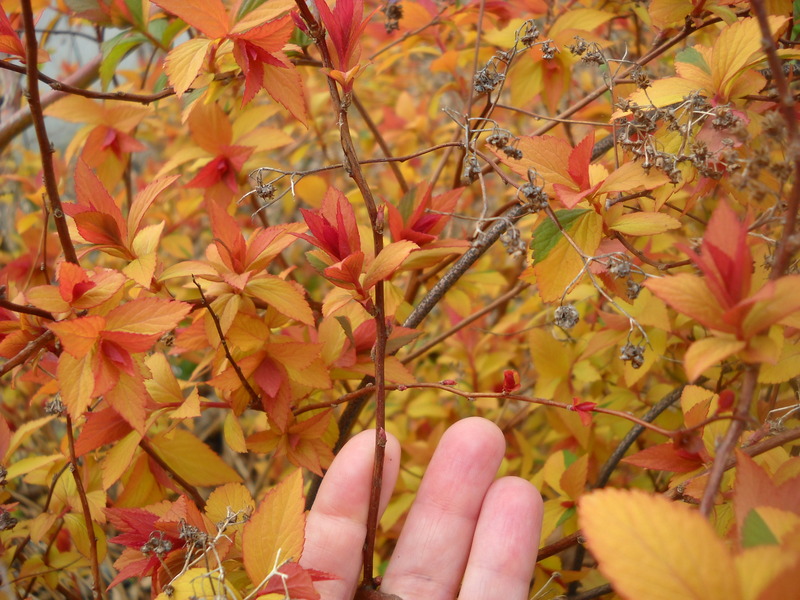 Spirea japonica. This one I love because it has such a nostalgic air and fragrance about it. We had a spirea hedge when I was very little, and so of course the smell of the flowers on my little S. japonica ‘Anthony Waterer ‘ feels somehow very comforting. 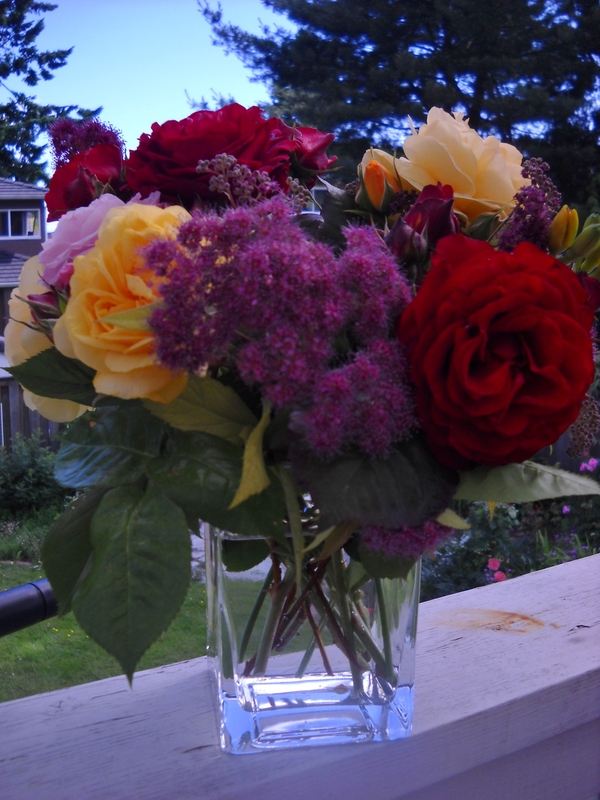 and the flowers make lovely bouquets. What more could you ask? 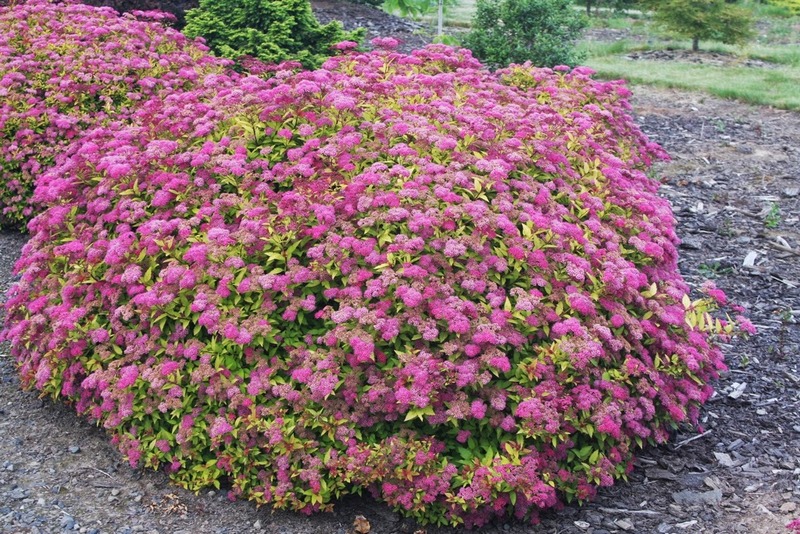 What are your favourite hedging shrubs? Do you have other suggestions for a hedge that welcomes yet offers a degree of privacy? 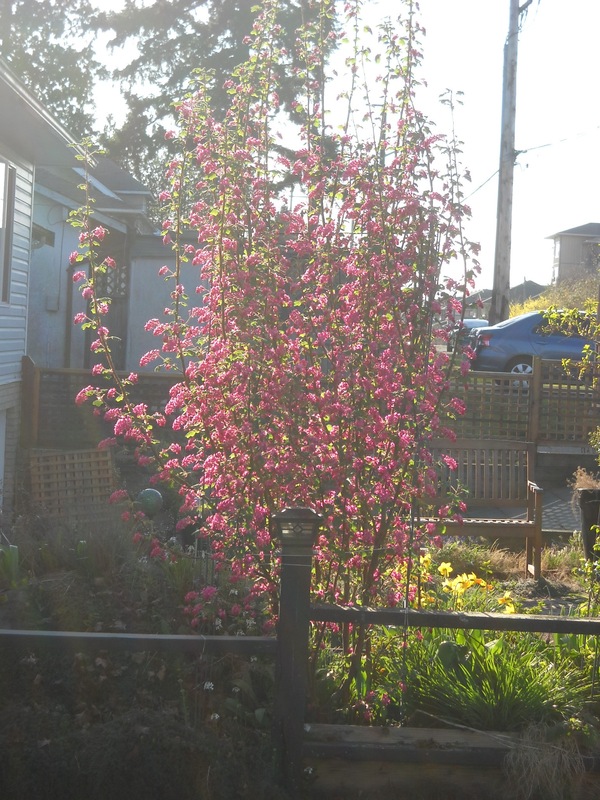 This entry was posted in 5 Things, design, garden, landscape and tagged Ceanothus thyrsiflorus, Mahonia aquifolium, ribes sanguineum, Rosa 'Hansa', spirea japonica Anthony waterer, welcoming hedges by Janet. Bookmark the permalink.